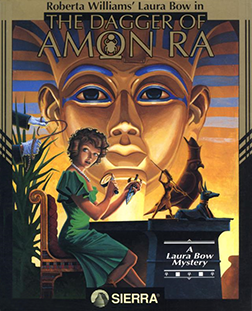 This game is also known as “Roberta Williams’ Laura Bow in: The Dagger of Amon Ra.” It is the second (and last) game in the Laura Bow Mysteries series. The protagonist is journalist Laura Bow, and the game is set in 1926. If players do not answer questions indicating they have solved the case, the end of the game will not reveal the killer (though it will suggest how they might have played differently to learn the answer).